At the moment, you can either let your end users sort it themselves via the “Exploration menu” or switch through them yourself in the edit view. In this chart, the default sort when switching to [Date.Year] is descending – as such 2017 appears before 2016, etc (newest to oldest). This is contrary to how Year-Month is shown, which is in ascending order (oldest to newest), and needs to be updated to match. As mentioned, this means we must go into edit mode, switch round the active and alternative items on the Data pane, and then make the required changes on the Sorting pane. 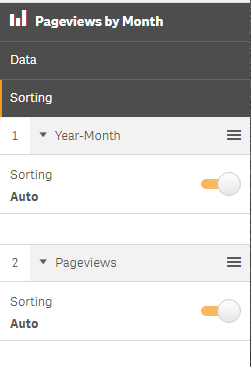 Once done, change the Data pane back to the it’s original order – any changes you have made on a specific dimension or measure (alternative or otherwise) will have been saved in the background, and users accessing the chart will benefit from your new sort order for those alternative items. Hopefully this functionality will be streamlined in a later release.